SIX hours into a walk, sitting alone on a mountain summit. I hadn’t seen another soul for nearly five hours. It seemed as though a switch had been flicked; holiday season over, the crowds dispersed until next July, and autumn taking a grip on proceedings. For the past couple of months, even the most remote mountain tops had seen a lot of footfall. Now normality had been restored, solitude once more a distinct possibility in our wild places. And if it’s solitude you’re after, the hills of that vast swathe of land south of the Cairngorms and north of Pitlochry and Blair Atholl are always a safe bet. In a country as small as ours, this domain of the waters of the Geldie and the Feshie, the Tarf and the Tilt, is a huge area of isolation. The Linn of Dee car park is still busy, but the crossing at White Bridge just three miles west seems to be the gateway into a different world. The majority of the few heading this way turn up towards the western Cairngorms. I was the lone pilgrim continuing along the Geldie Burn, heading for the ruin of the lodge and the two Munros far beyond. Carn an Fhidhleir and An Sgarsoch often elicit groans from many chasing a full Munro round. They are seen as dull and uninspiring, a double nuisance on a 25-mile round trip to be endured to reach a greater prize, and bikes are a familiar sight for a dash in and out. But this is a walk I have learned to savour, the very emptiness in a bleak landscape that can leave so many cold a reason to celebrate. It’s one of the few places in this country where you feel there is a never-reached goal, a horizon that keeps stretching further no matter how far you have come. The track by the waters of the Geldie keeps going long after you leave it, snaking off into the distance and confines of Glen Feshie. Routes south eventually lead you to Glen Tilt or the wastelands around Tarf Water, after a fair bit of ascent and bog trotting, of course. It’s a wanderer’s paradise - casual walkers are in short supply here. Hidden amongst a plethora of rolling hills are two remote Corbetts, Beinn Bhreac and Leathad an Taobhain, the latter with more than a dozen subsidiary named tops for the connoisseur. 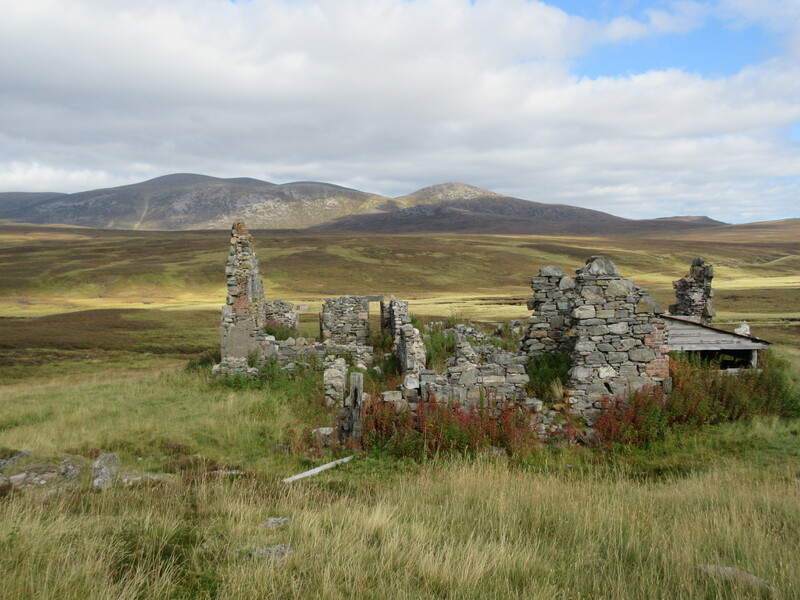 Beinn Bhrotain and Monadh Mor are constant, but distant companions, a lot of the time and scattered along the way are a number of ruined buildings, signs of a vibrant life long ago abandoned to nature. The summit of An Sgarsoch was a venue for a cattle market in ancient times, and tenant farmers worked the land below before being displaced around 1830. The tumbled walls of the former hunting lodge at Geldie seem to diminish further with every visit, a victim of time and weathering. 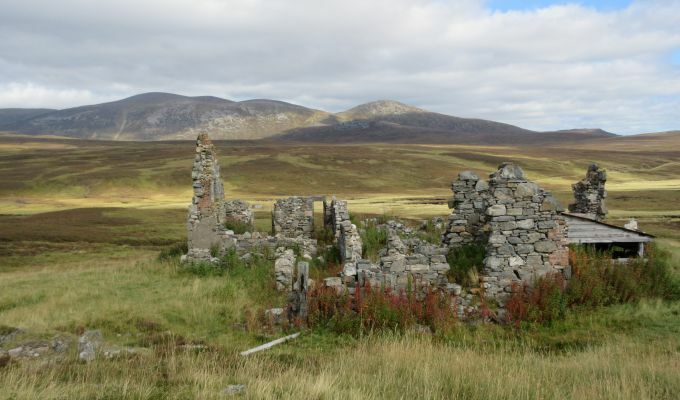 A few more years and it will be reduced to the same fate as nearby Bynack Lodge and so many shielings, a ring of stones finally overrun by vegetation, invisible to a new generation. It’s not the only one. On the way in, the skeleton of Ruigh-nan Clach can be seen among trees on your right, then the remaining shell of Ruighe Ealasaid – Elizabeth's shiel – sometimes referred to as the Red House. The bridge near the confluence here is also gone, now merely a spaced line of concrete pillars standing in the constant waters. It seems ironic and yet, at the same time, fitting, that the low-key Carn an Fhidhleir was one of the three summits on Sir Hugh Munro’s list he failed to reach. He had climbed it under cover of darkness to avoid interfering with stalking but couldn’t locate the cairn. My first ascent of these this pair was also during the night. 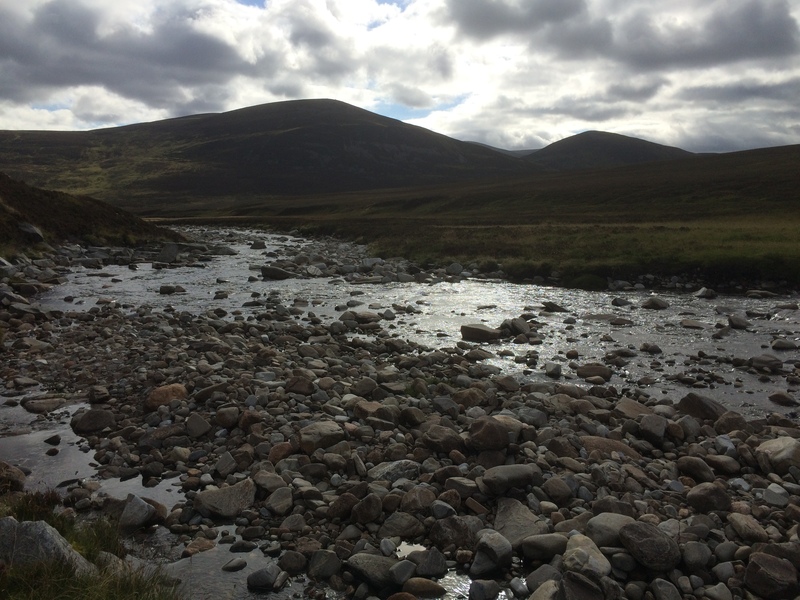 I found the cairn but later got into grief on the descent from An Sgarsoch, failing to find Bynack Lodge and then having to cross an raging icy river in darkness. It drove it home to me just how far from help I was, but that’s a price worth paying to guarantee a few hours’ solitude.